I am so pleased to announce that my new book is now available for purchase at the Haynes Library in Governor’s Harbour and on our website eleutherabook.com. 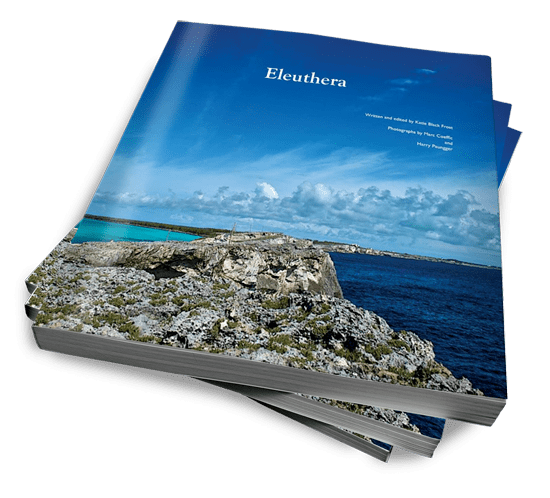 Eleuthera is a 12″ x 9″ hardcover, full color, 112 page book featuring 100 extraordinary photographs of Eleuthera, Bahamas. Eleuthera is a collaboration between myself and two local photographers, Marc Coeffic and Harry Paungger. The book comes from our hearts with love for Eleuthera. We chose 240 photos over four months of deliberation, looking at decades of Marc’s and Harry’s beautiful images. I wrote the foreword and section introductions, selected the final 100 photos, layed the book out and wrote the captions, and published it. We received our books here on Eleuthera last week and had a successful launch at the Haynes Library on Monday. I encourage you to visit eleutherabook.com to learn more. Cheers! Wow, Katie, I am so excited for you. The bits on the website look wonderful. I just ordered my copy and can’t wait to see what you’ve done! Ordered mine the day it “came out” – can’t wait to see it and am SO excited to be back on Eleuthera in a few weeks time. Congrats on the book!! Congrats my friend! This is a labour of love no doubt. Lets catch up soon.